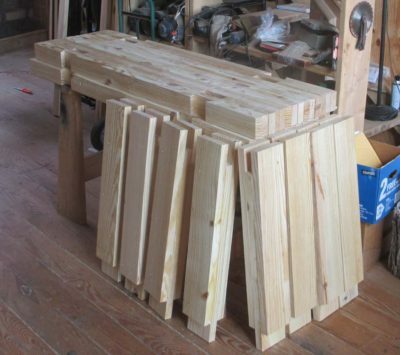 A woodworker walks into a brew pub, glances around, and spots another woodworker across the room. As the first man approaches the second, words ensue. 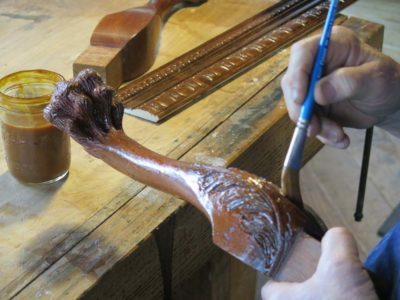 In a few seconds the second woodworker clenches his hand into a fist and sticks it right under the nose of the first man. This might be Mickey Spillane’s telling of a episode a the recent Lie-Nielsen tool event in Covington KY. Of course there is much more background to the tale. 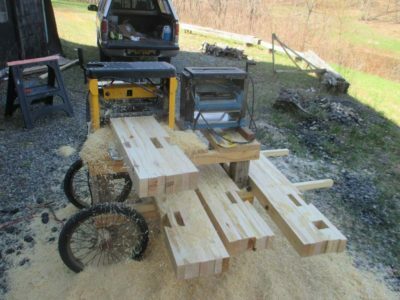 The two woodworkers in question were Dr. MichaelCD and me. Michael is a professor and practitioner of the healing arts, particularly as they relate to the repair and rehabilitation of injured hands and wrists. We have been corresponding regularly since I broke my arm last year. His counsel has been a Godsend, especially once he convinced me that I was working too aggressively on my rehab exercises and was actually retarding the progress. Once I learned to ease up a bit the progress was much faster. At the end of the day in Covington I bestowed Michael with a whisk broom and the best meal we could find close by, a time of grand fellowship. That’s the way health care should be. Now if only they could figure that out in Mordor on the Potomac. In parting he gave me a new finger flexibility regimen that I have been following with much success. Oddly enough the part of arm/wrist/hand rehab that is usually the hardest (rotating the hand relative to the elbow) went very well and fast for me, while the more simple and easy recovery (hand and finger dexterity) is something I still wrestle with. It gets better every day as I notice something new I can do; roll the toothbrush in my hand, put in my contact lens, use a credit card reader, unscrew the gas cap in the truck, and finally today, using a spring clamp for the first time with that damaged hand. At this rate I expect these hurdles will be distant memories by the time I hit the First Anniversary. But for now, thanks to Michael I am well past the 90% recovery mark, and find my effectiveness in the shop at almost 100%. To top it all off, my left arm and hand are by necessity much more facile than they were a mere six months ago, in the end yielding greater aggregate hand skill than I started with. How much more blessing can a fellow take? 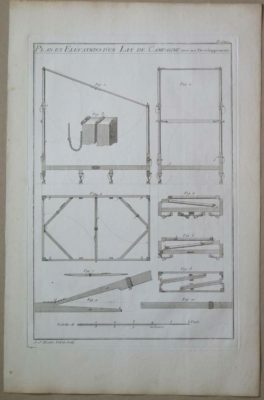 We have a wonderful companion to the previous print in my inventory of First Edition prints from L’Art du Menuisier, this one being “Diagrams and Illustrations of a table and a camp bed with their Developments.” Again this page is in near-excellent condition with just the teensiest bit of staining along the top and bottom edges (this would be completely hidden by the mat when you get it framed. 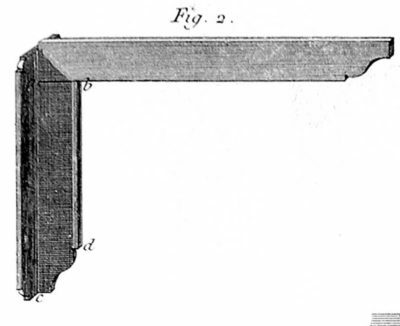 The plate was drawn and engraved by Roubo himself. 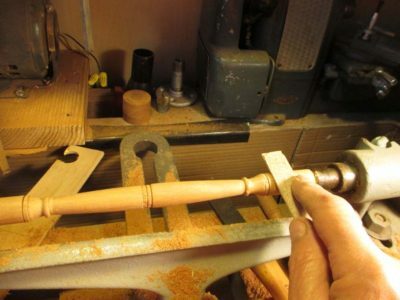 I recently spent a day turning small-ish spindles for a project now on the home stretch. 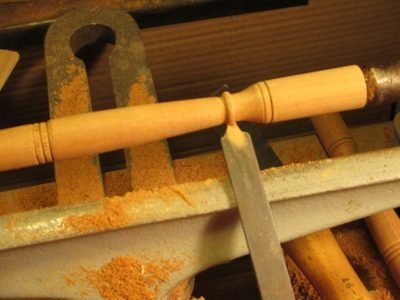 The overall length of the spindles was roughly 12″ with a maximum diameter of ~3/4″ and a minimum of ~1/2″. This was one of those times I really appreciated the four-jaw chuck I bought many moons ago as I could easily switch from square stock to round stock in a matter of moments. 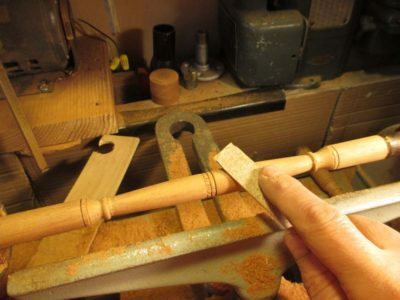 Given the delicacy of the spindles, and despite the fact that I was using some excellent old-stock true mahogany, I could not hog off the material and needed to be fairly conscientious about the detailing which included several beads that were just a smidge shy of 1/8″. 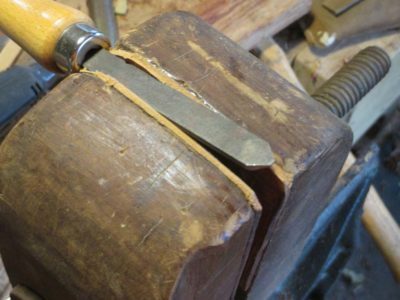 I had previously tried many turning chisel combinations for the effect without easy success, and even ordered a so-called 1/8″ beader made by Sorby. Though a fine tool, apparently one of us does not know how to measure 1/8″ so I just hung it back up on the rack hoping to someday have a project where I need to turn some fat 5/32″ beads. For a brief moment I thought about re-making the tool into something more useful for this project, but instead I cast my eyes on the worthless parting tool (is that redundant?) in the rack. I do not find the spear-point parting tools to be at all useful, and certainly not this dog, so I instead I decided to turn it into the beader that I needed. So I did, with my Dremel and slipstones and a half hour. It now works exquisitely. I tried it out on a practice piece and was very pleased. You can see how Ihad aready turned some of the beads into chum by other methods. For other detail work on these spindles I took a few surplus plow plane irons and ground and honed them into shapes that fitted my needs perfectly (including a parting tool that is worth the title). I have some additional plans for more unused plow plane irons and will document that at the time. 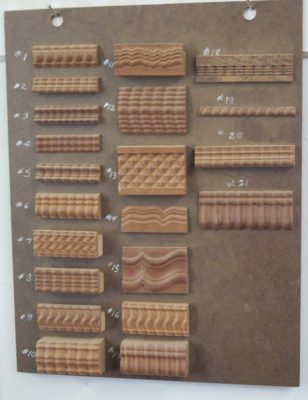 One final old favorite that became a treasure was the pile of tongue depressor sanding sticks I made some time ago. These are great for providing delicate shaping (using the 60-grit side) and a fine surface with the 180 grit side, keeping my fingers out of harm’s way the entire time. The intricacy of this print speaks for itself. The page is in excellent, near pristine condition. 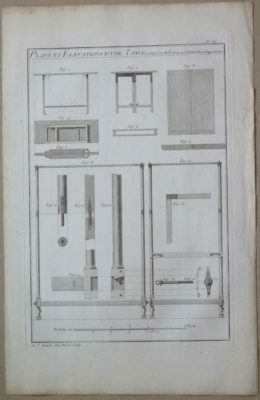 As an added charming feature the plate and the page were not perfectly aligned so the hand-printed image is ever so slightly askew compared to the page margins. 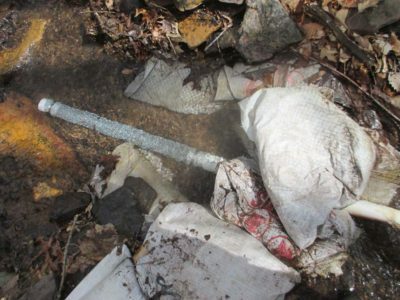 With the passing of winter (fingers crossed) and the hydroelectric system de-mothballed, I undertook my annual ritual of tuning up both ends of the penstock, or pipeline that carries the water from the small dam at the top to the turbine at the bottom. 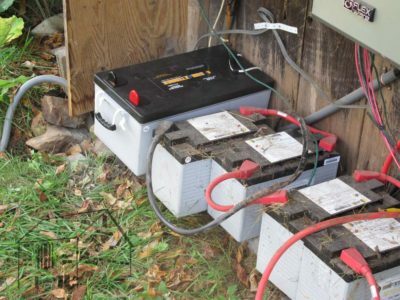 My first big upgrade a few years ago was to swap out the original four large capacity Tractor-trailer deep cycle batteries for four ultra-mega high performance deep cycle batteries for storing the generated electricity. Each of the new batteries has the capacity of the entire previous battery bank, so with this step I increased my power storage 16-fold. BTW each of the new batteries weighs 192 pounds, and these are the largest capacity 12v batteries available in the US. A couple years ago I swapped out the rock-and-concrete catching dam at the edge of the property for a rock-and-sandbag one three hundred feet closer. I did this to save myself the intense maintenance involved in that last hundred yards of run which provided only another ten feet of drop. It just was not worth the added effort, being more than 25% of the penstock maintenance for a return of about 8% in the power output. Besides, the new site was perhaps the nicest narrowing of the creek with a huge rock on one bank and a great source of stacking rocks for the other. Once again this year my debris filter needed replacing, something I will just have to plan in doing every other Spring unless I can find some stainless steel 1/4″ hardware cloth. It only takes me four or five minutes to make a new one, and it swaps out with the older one in about fifteen seconds. I spend way more time walking up to the site and anything else. On the bottom end of the penstock I also refined some revisions I’d made in previous years. 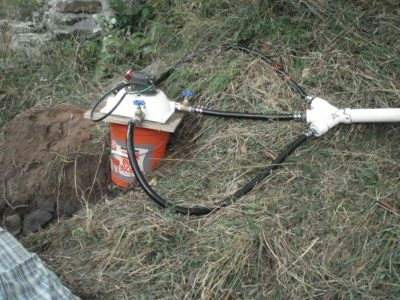 The turbine came with three graduated fixed nozzles when I bought it, 1/4″, 5/16″, and 3/8″, to provide for a nearly infinite variability in the system flow control. 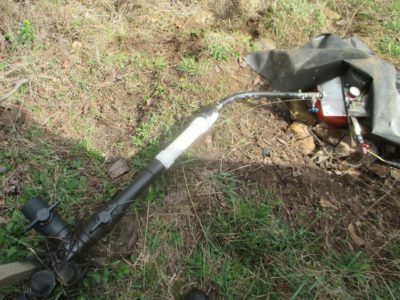 This required pipe fittings leading the three high-pressure hoses going to each of the nozzles, and the Y-pipe fittings were a maintenance headache. Previously I’d cut the options down to two nozzles and their fittings, but I realized that the only one I really needed was the largest one and reconfigured the routing again. Now it’s just a straight shot leading to a single hose and nozzle. 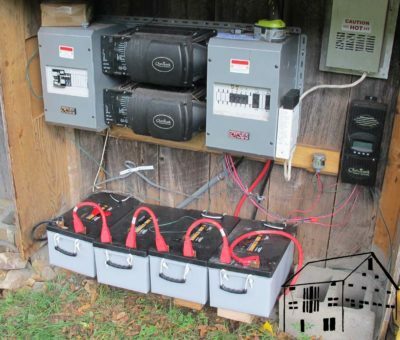 The output of the hydro system is running about 10-12 kwh per day, which is way more than I need for most any day. 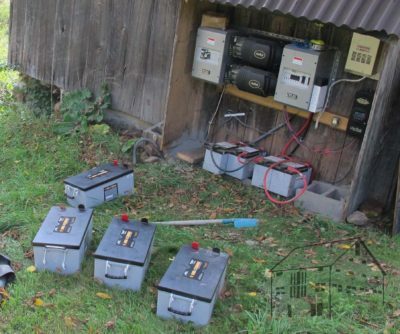 Even running a planer for three hours or the wax cookers all day is no problem, especially on a sunny day when the solar panels kick in another 8-10 kwh. My next system projects are to build a heavy-mass turbine housing to dampen the whine of the turbine, which interferes with the gurgling of the stream, and build a new powerhouse for all the electronics inherent in the system..
Last month I was visited by Joshua Farnsworth, Ray Pine, and George Lott, for a wonderful day of fellowship, filming, and yakking about woodworking and rural living. Joshua shot a bunch of video to be edited and compiled and the first one was posted last night. You can find it here. Clearly I have a face for radio and a voice for writing. 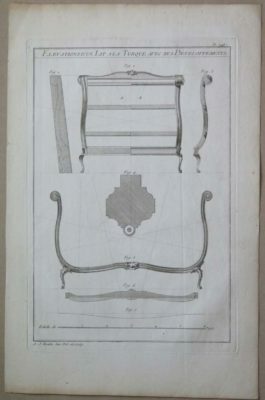 The artistry, rather than the mere technical mastery, of Roubo as both a draftsman and engraver are on display here as he shows the composition and design aesthetics required for creating “D’un Lit a la Turque.” Frankly I am uncertain of what makes this a Turkish Bed, as opposed to the Polish Bed, the English Bed, the Martian Bed, etc., he presents in adjacent sections of the book. Regardless, it is a lovely illustration and the page is in excellent condition, in fact I would say that there may be several in my inventory in as good a condition, but none better. 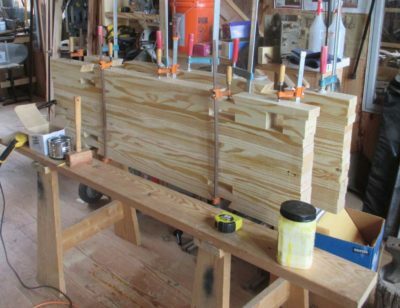 This was a short work session as it totaled only a couple of hours removing all the clamping screws from the half slabs and legs, running them through the planer, and clamping the slabs up (using standard bar clamps for this step). 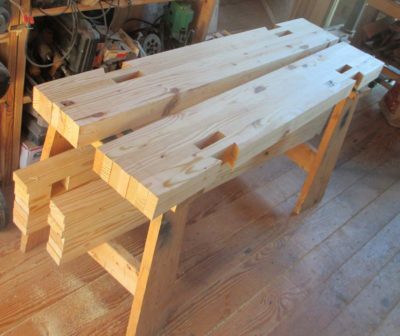 The last half-day will be sawing the dovetailed tenons and removing the excess tenon-like protuberance from the bottom of the legs, truing the tops and trimming the ends, and driving home the legs in the double mortises. 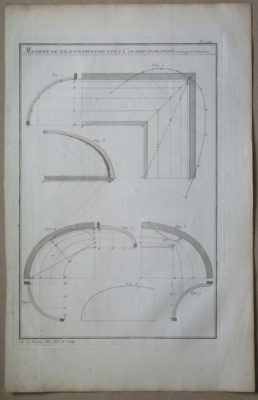 Up next in our Magical Menuisiery Tour is Plate 245, “The Way to Draw Extended Curves Used on Bed Canopies.” Like all of the geometery exercises in L’art du Menuisier this plate was drawn and engraved by Roubo himself. The print is in very good condition due to some spot staining (not really disfiguring but present). The edges of the page have the oxidation fully in keeping with a print that was pulled and bound in 1774. If you have ever wanted to own a genuine piece of Rouboiana, this is your chance. And if you have any plans to build a royal bed with an oval canopy with lace draperies and bed linens, you are in luck! I will be selling this print at Handworks on a first-come basis, with terms being cash, check, or Paypal if you have a smart phone and can do that at the time of the transaction. This event is pretty much full. I still have one space left. This class has been cancelled. Vic and I are hoping to reschedule it for next summer. This class has one opening remaining. This workshop has two openings remaining.